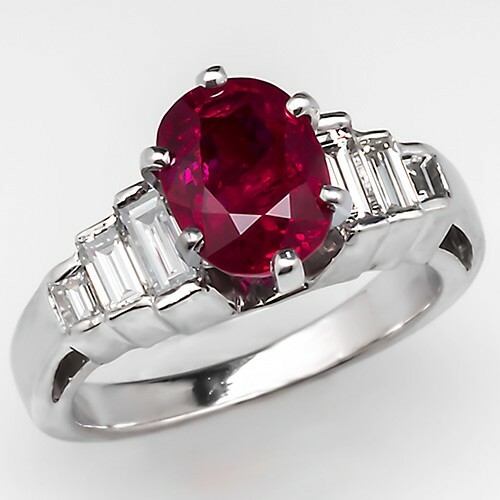 The blood-red ruby has captivated the eyes of man since ancient times. Like the flames of fire after which it was named long ago, it draws the gaze and holds it captive to its brilliance. Before gemological labs, before dichroscopes and microscopes, before democracy, before we knew as much as we think we know now, all blood red stones were considered Kings of the Gems. Their name was different from today's name. Not the ruby we know in modern times, whose name is based upon a more modern science and history: Rubinus, a Latin word which means, rather blandly, 'red'. No! Then, it was called Carbunculus, (now an archaic term) which teemed with the dynamic force of smoldering coals. The word is also Latin, but it is a far less clinical term of categorization. Rather, it is a visceral term of description. How does the stone behave when held up to the sun? What happens if we strike this other stone of known hardness with this new alluring red stone? Can we engrave it with the images of our favored gods and kings? Can we cut it into the shapes our women fancy? Can we draw the eye of the king with it? These and more were the questions posed by the scientists of old when holding the flaming red Carbunculus in their hands. And the answers to many of their questions were promising. But not all. All of them caught the eyes of kings. All of them shone with the brilliance of the sun. But some of the Carbunculus did not take to engraving. Some of them did not attract stray bits to themselves. Some did not weather the effects of fire intact. We know now that this is because those fiery gems, lauded by Marco Polo, Pliny the Elder, and Theophrastus, were not all the same. A ruby by any other name may look the same, but today we know that only corundum, that pure crystallized alumina, has a hardness nearing the diamond. Only the corundum now commands the price of kings. Only corundum withstands the flames of fire after which it is named. However, in ancient times, without the power to differentiate, garnets and spinels were often considered color variations of the corundum rubies. It is garnets that were wildly popular for the art of the intaglio, and many spinels of fine quality are mounted in the crown jewels of Europe's royalty. Those gemsmen of old were limited in their differentiation. However, as the tools of the gemologist increased, so did the distinction between the Carbunculi, so that now we no longer confuse the three together. Indeed, they are not of the same species. Where ruby is comprised of alumina, spinel is magnesium aluminum oxide. And garnet is a vast mineral group which has silicate at its base. Ruby is the hardest next to diamond, and it withstands the flames of fire. It is the birthstone of July. Garnet is the most varied, able to be cut in every size and shape. It is the birthstone of January. Spinel is the rarest, found in many of the same areas as ruby, but fairly unappreciated. It is not a birthstone, though it takes pride of place on the ceremonial crown of England. All are beautiful. All come in shades of brilliant blood red. All are gemstone grade. All are worthy of our attention.